All normally OK choices, but nothing enough to satisfy the post-run craving of something filling, fresh, and good-for-you. So, though pressed for time, I boiled water for whole wheat pasta, tossed in some frozen peas, sliced up a leftover piece of grilled chicken, and warmed up my leftover roasted garden tomato sauce from a few days ago. Add some cheese, pepper, pepper flakes, and voila. The perfect meal for any runner. I sat down with my creation and began to type about my lunch to Bryan (c’est normal), when there was a knock at the door. The mailman. He was gorgeous and young, wore Ray Bans, and probably wasn't abiding by the Postal Service dress code. But he was my nemesis. In May, the NY Road Runner "Run for Boston" shirts that Bryan and I ordered had gone missing. As in, everyone assured me they had been delivered, and yet I did not have them. I blame this on the mailman and his Ray Bans and lackadaisical ways. This was particularly disappointing, as I have spent a lot of time boasting about the superiority of the US Postal Service over La Poste in France. Before The Incident, they had always delivered my mail through rain, sleet, snow, etc. La Poste, on the other hand, failed to consistently deliver my packages since 2008. Tide pens and autumn Yankee trader candles that ended up in...well, not in Paris. An iPhone case that was lost in space. American magazines that showed up at my house on Long Island months after I had mailed them to France. Based on past experiences, I was shocked when a package arrived at my door addressed to me. I tore open the envelope and the not-even-released-yet The Runner's World Cookbook was revealed. A look at the billing info confirmed my suspicions – Bryan. From the moment I saw The Runner’s World Cookbook, I was in love. It combines the only four things I am really interested in at the moment: running, eating, cooking, and rustic looking pictures of food (just check out my Pinterest boards). There are healthy, delicious sounding recipes for every craving and situation. 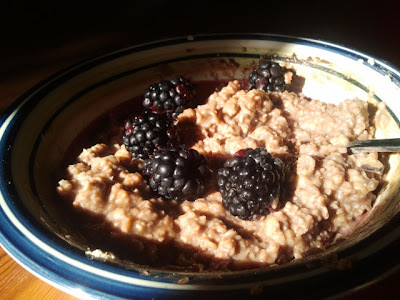 Pre-run and recovery choices, vegan, vegetarian gluten free, fast (as in, what I was looking for not 20 minutes prior to the cookbook delivery) and low-cal categories in addition to the typical breakfast, soups/salads, meats, grains, dressings, and desserts. Equally delightful: a list of things to always keep in your pantry – incredibly similar to what a broke-but-kitchen-savvy 20-something already has stocked in the kitchen (i.e., a variety of beans and grains, nuts, oil, whatever produce is in season…). And at the top of each recipe, a brief paragraph about why it’s good for you. So instead of being vaguely pleased because the meal you've created seems healthy, you’ll know specifically why you are making awesome choices. The ingredients and the recipes are usually simple, many reminding me of the way Bryan (and me, after those 3 months spent learning to cook by standing just outside of Bryan’s 2-foot Parisian “kitchen”/hallway) cooks already. At the same time, I’m incredibly inspired by all the new ideas and combinations. Yes, we could have thought of that, but we hadn't yet. The most exciting part? 50 ways to change up pancakes, with different suggestions including guacamole, pumpkin purée, cocoa powder, black beans, and even beer! Other notables include a healthy version of gratin dauphinois, steel cut oatmeal risotto with asparagus, garlic shrimp with white beans and tomatoes, ALL of the smoothies, and blackberry dressing. This cookbook was made for runners. But it is the perfect choice for anyone interested in healthy, satisfying, and great tasting (I am assuming, based on the ingredient list and the pictures) food. My dad, a runner but definitely a non-cook, has been cutting out the sneak peek cookbook recipes in Runner’s World magazine for months. If it can inspire him, it can inspire ANYONE. As for me, I can't wait to get cookin', and, luckily, I have the whole weekend ahead of me. Bridget is an avid runner based in New York, but splits her time between fantasy dream country homes and sometimes a shoddy little Parisian apartment by the Canal. Photos courtesy of, well, her. Wow, congratulations you have been wonderful cookbook, your article is interesting, thank you. 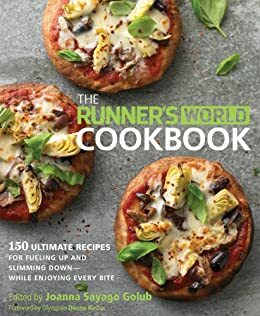 i am a huge fan of the Runner's World Cookbook. i just can't wait to cook all the recipes!